Review: This film is about a man who seems to be very quiet and to himself and at times very pathetic ,but what lies beneath his seemingly weak exterior is a cold blooded killer who likes to pop out when you least expect. Throughout this film you see Tony get pushed around and treated like trash and I think that is alot due to his quiet demeanor and what seems like lack of confidence. The actor they picked to play Tony was a perfect pick because he plays the role quite convincingly and brings out a character that I like to call an english version of Dahmer. This film has some very creepy moments in it like for example when he wakes up and you can see him laying next to a rotting corpse and asks it if it wants breakfast. He very much reminds me of the serial killer next door that you don't realize is one until they are taking barrels and barrels of dead bodies out of their place and a news crew is asking you about the neighbor. I have to say this is one of the best films about a real or not real serial killer that I have seen since I first laid my eyes on "Henry: Portrait of a Serial Killer" and I seriously mean that. This film brings such a realism to the character that makes you feel as if your watching a film about a real killer and I think it's all thanks to the excellent acting of Peter Ferdinando. On a side not I have to say that he does look alot like Napoleon Dynamite's brother. 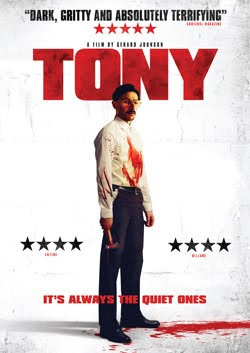 Overall this is an excellent film that takes you through the life of a psychopath and I really hope to see Tony return in another film. One last thing I must let you know is that you also get the original short film "Tony" on the DVD as well as another short film entitled "Mug".